Welcome! I am Rie Sheridan Rose, and I love to write. 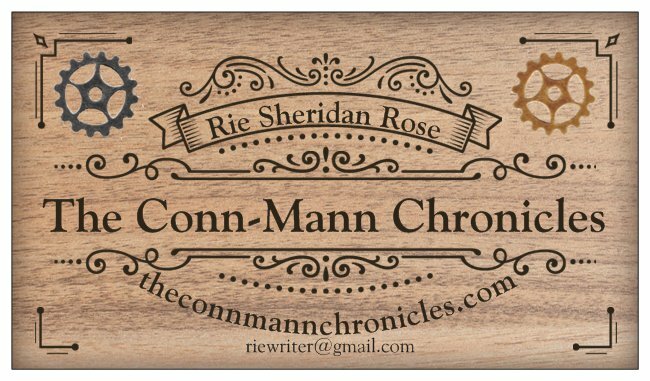 Although I write a lot of everything, my favorite work to date is the Steampunk (well, STEAM at least, light on Punk) series The Conn-Mann Chronicles. It all started one year (somewhere about 2012) when I had been trying to decide what to do for NaNoWriMo that year–if you’ve never given it a shot, I HIGHLY recommend it. More info here–and my best friend challenged me to write something Steampunk. Well, I loved the Parasol Protectorate series, so that sounded like something fun to try. Because I never like things easy, I decided to also try something else I had never done before…writing a full-length novel with a First Person narrator. One thing led to another, and Josephine Mann was born. Jo is an opinionated young lady (well…woman) who is writing down her adventures with her employer, absent-minded professor Alistair Conn. It’s been an interesting time they’ve had of it too–full of kidnappings and blackmail and new friends. Jo is one of those people magnets that collects entourage wherever she goes. The link to the Chronicles above takes you right to the novels page on the website. What started as a single book has now grown to a five volume series. The title links on that page take you to the individual book pages, where you can read the first chapter of each book and see what you think. There are also links to the Kindle and paperback versions. This series has been so much fun to write. I never managed to finish a sequel to anything else before, much less a SERIES, but Jo keeps nagging me until I help her get things down on the word processor. And their adventures are not confined to the pages of the Chronicles. Jo and Alistair have managed to sneak themselves into several short story anthologies as well. If you visit the website, be sure and sign up for my very infrequent newsletter (there should be a pop up on your first visit) for a chance to win a $25 Amazon gift card. Even if you have signed up before, if you get the pop-up, sign up again, because the GDPR has decimated my original list. If you are still on the list from before (Thanks, loyal fans!) I will still be drawing for a $10 gift card from all my old friends. And there may be more surprises later in the day.